Nintendo has unveiled a new product category called Amiibo at this year’s E3 digital event in Los Angeles. When placed on a Wii U Game Pad controller, the NFC-enabled figurines can appear in a range of compatible games as playable characters that can be trained and are able to gain skills and attributes the more a user interacts with them. The collectable figurines will be released alongside Super Smash Bros for Wii U this coming holiday season, Nintendo says, and they will also be made available for other games including Mario Kart 8, Captain Toad: Treasure Tracker, Mario Party 10, Yoshi’s Woolly World “and more” in the future. Ten different Amiibo figurines, representing Nintendo’s most popular characters, will be available at launch with more to be released on an ongoing basis. From next year, players will also be able to use their Amiibo figurines in compatible Nintendo 3DS games, via a standalone device that supports both NFC and Bluetooth. “Only on Nintendo systems will you be able to enjoy all the different experiences in this ‘toys-to-life’ category,” Reggie Fils-Aime, president and chief operating officer of Nintendo of America, explained during a presentation at E3. “There is a special chip that is embedded in every figure; any Wii U system will recognise the figures by touching them on the Wii U Game Pad and, when that happens, they spring to life in compatible games in cool new ways. When you touch Amiibo to the Game Pad, the character’s data is downloaded into the game you are playing and it is also a two-way stream — we can send information back to the figure. “So, in other words, your figure’s data changes as you play which opens the door to various new game-playing possibilities. For example, your own figure with its own unique stats and fighting style will not only appear but also evolve as a fighter in Super Smash Bros.
“When you touch these Amiibo to the Wii U Game Pad controller, you will see these characters come to life in your games in many different ways,” added Bill Trinen, senior product marketing manager at Nintendo of America. “Amiibo will expand the gameplay experience of supporting titles and bring about new types of fun and new ways to interact with your favourite Nintendo characters. “Each figure contains the spirit of the character they represent so when you touch Amiibo to the Wii U Game Pad, that character will appear in the game to do battle while you cheer it on from the sidelines. Every time your Amibo battles, its attributes will get a small boost. Through battle, they can increase their overall level, along with their defence and attack powers. They can even learn tactics to become stronger opponents. Is getting an amiibo the only way that I can use my wii u game pad to fight in super smash bros for wii u.
I don’t think so. You can use the GamePad like a regular controller; it’s just that it also acts as…let’s say a conduit for your Amiibo to get into the game. They aren’t absolutely necessary, but they sound cool as hell. 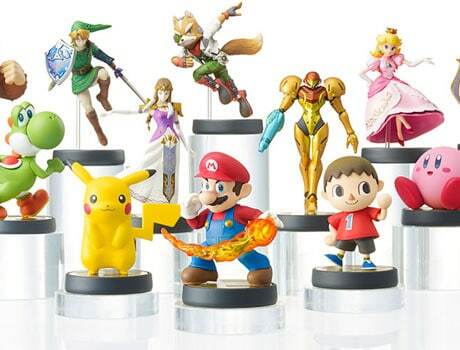 Will Amiibo Figures work with the New Wii U Console?